Tarbender bar top epoxy is a UV resistant clear liquid epoxy that can be poured over a variety of surfaces to provide a strong, high gloss coating. Parts A and B mix together and flow easily. Tarbender epoxy cures at room temperature and offers high impact resistance. 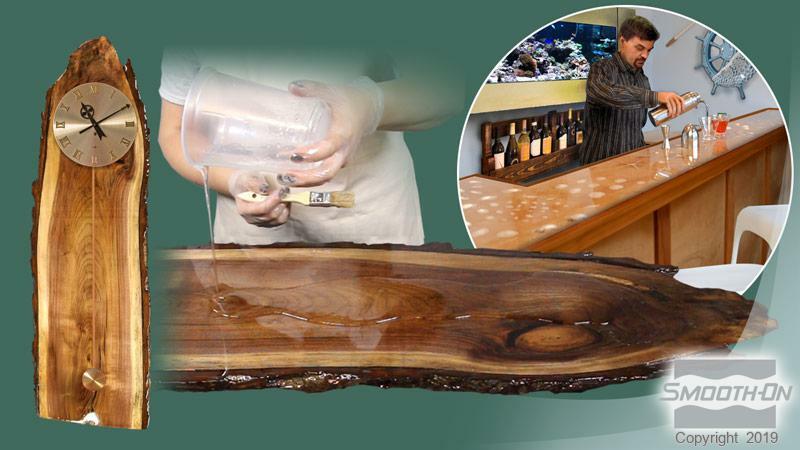 Tarbender is an excellent wood bar top epoxy coating and can also be poured over plaster, concrete, foam, fabrics, etc. You can use Tarbender to encapsulate 3-D objects or coat flat objects, paper and more. Mixing containers should be made of plastic, metal or wax coated paper. Due to very high temperature potential (exotherm) of Tarbender , do not use glass or foam containers. Ventilation: Use only in a well ventilated area and avoid breathing fumes. Wearing a NIOSH approved respirator is recommended. Usage Overview: Most bar tops require 2 – 3 layers of Tarbender® with a 4-hour cure time in between layers. You can apply as many ¼” (6.4mm) layers as needed. Estimating Coverage: How Much Will You Need? you can correlate the square inch (cm) area of your bar top with the yield of mixed Tarbender . Surface Preparation: Bar top surface to be coated with liquid epoxy should be level in all directions. Surface must be free of dust, oils or other contaminants. 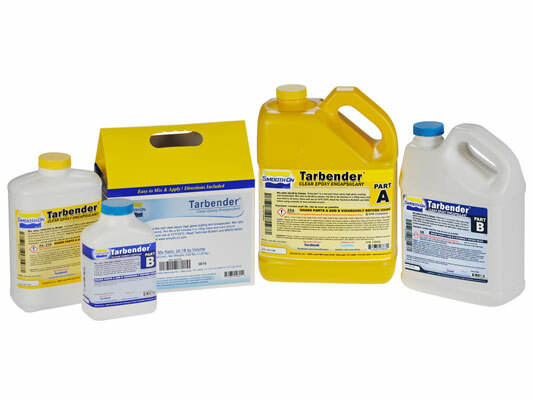 Tarbender should not be used on surfaces coated with oil-based stain, as it will delaminate. Water based stains are compatible. Sealing Porous Surfaces: unfinished wood surfaces, stone, marble, concrete, etc. should be sealed with a thin layer of Tarbender . See “Pouring and Spreading Tarbender ” section below. Pre-Mixing: Pre-mix Part B Before using – Shake Part B container well for 1 minute before dispensing. Measuring: Accurately measure 2A:1B by volume into a plastic, metal or wax-free mixing container. Mixing: Mix using a flat edge wooden paint stick for 2 minutes. Scrape the sides and bottom of the mixing container with the edge several times. Pour contents into a new, clean mixing container and mix again for 2 minutes. If using a drill mixer, use a variable speed mixer set to low rpm and mix for 2 minutes. Creating a vortex will introduce air. Follow with hand mixing for 2 minutes. A large mass concentration of epoxy will reduce pot life and may become too hot to handle. If concentrated mass of epoxy begins to get very hot, move outside to open air. To extend working time, reduce mass by pouring mixture into a flat baking pan and pour onto bar top from there. Do Not Vacuum: Subjecting mixture to vacuum will introduce air. Pouring Tarbender: After mixing, pour a thin stream along the entire length of the surface. Do not exceed 1/16” (1.6 mm) for this layer. Your goal is to obtain an even coating. Let Tarbender cure for 4 hours before applying another layer. Note: do not exceed ¼” (6.4 mm) thickness per pour. If greater thicknesses are desired, pour in layers of ¼” (6.4 mm) with 4 hours minimum between layers. NonPorous Surfaces do not require a sealing coat. Mix and pour Tarbender as directed to ¼” (6.4 mm) thickness. Look for bubbles and lightly pass propane torch over surface to dissipate. Let cure for 6 hours. Dissipating Bubbles from Surface Using a Propane Torch - After Tarbender is poured, pass a propane torch (available at any hardware or DIY store) back and forth lightly over surface to dissipate bubbles. Be careful when handling the torch and do not get closer to the surface than 3” (7.62 cm). If pouring multiple layers, use a propane torch to dissipate bubbles after pouring each layer. If Encapsulating 3-D Objects: Apply a 1/16” (1.6 mm) coating to bar top as directed above. Dissipate bubbles with torch. Let cure for 4 hours. Place objects on top of cured layer. Mix a small amount of Tarbender and pour directly over and around objects to break surface tension. If Encapsulating Paper, Cardboard, etc. : Laminate paper before encapsulating. You can also seal surface with white glue (such as Elmer’s Glue) mixed 4 parts glue to 1 part water). Allow to dry for 16 hours before encapsulating in Tarbender . Adding Color: You can add SO-Strong or IGNITE color tints. Pre-mix color tint into Tarbender Part A thoroughly and then add Part B. Adding New to Old: If too much time passes (72 hours or more) between applying layers of Tarbender , delaminating may occur if you try to add more. For Best Results; lightly sand cured epoxy surface with 220 grit sand paper and wipe clean with denatured alcohol before mixing and applying new Tarbender . Releasing Tarbender From Surfaces: if you do not want Tarbender to adhere to a surface, apply two coats of Sonite Wax. Allow wax to dry 1 hour and buff before pouring epoxy. Clean Up: 90 percent Isopropyl Alcohol will remove uncured Tarbender from most surfaces. It can also be used to clean the surface of cured Tarbender epoxy. Alcohol is flammable. Follow all safety precautions for handling flammable liquids and provide adequate ventilation.